My name is Danielle and it is with inspiration and urgency that I approach living life fully. Infinite Growth is the place where I do my heart’s work which tends to be connecting people and sharing resources around vision, voice, and actions we can take to expand our dreams in real time. Right now I am designing in-person experiences that combine silence, creativity, and meditation. I am also writing, which is the most tortured and meaningful work I do. It’s challenging to speak honestly about life, and that is what my voice keeps offering. Most of my writing is hidden, but it won’t be forever. 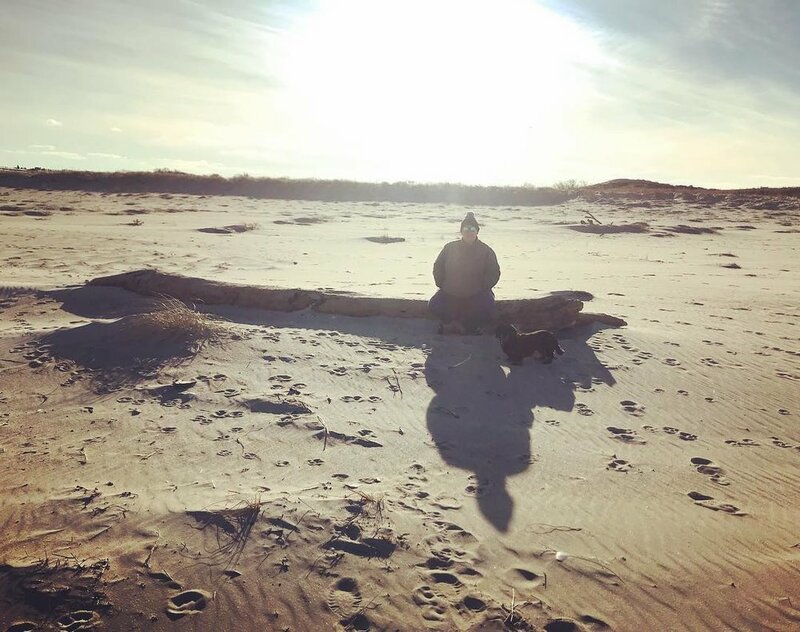 Photo by Erin Coates-Connor during shadow season 2018 at Crane Beach. Over the past two years I developed a multi-day in-person and online visioning course that has helped over 100 participants gain clarity about how to create the future they desire right now. I remain curious how to use a digital environment to create deep and nourishing connections. I do my best work when I am close to the ocean. We live in a time where exponential economic growth is the driving force of our society. And even when we are happy, which is grand, we know that the economy is leaving behind entire communities and destroying the planet that sustains our lives. Our lives in these bodies is finite, but our legacy as a generation reverberates long into the future. Future generations are depending on us to make the world a better place for them. The system trains us to believe we will be happy when we hit our financial goals, or change our bodies, or get more positional power. Certainly those things can be wonderful, a beautiful vista. It just seems that if the journey detached us from our own moral compass and creative impulse, a numbness or rage or regret or yearning remains. I’ve learned through misery that happiness begins on the inside. I ask myself everyday, what are you grateful for today? These are small steps we can take to regain our humanity. We can break the shallow hyper-connectivity that has created a dangerously thin layer of lonely ice in our lives and claim all the warm depth just underneath. Navigating those waters requires practice! Infinite Growth creates old-fashioned conversations between dreamers, doers, seekers, and finders. Together we can live well, and support future life on the planet. This will always be a work in progress. Infinite Growth intentionally convenes cohorts across races, religions, ethnicities, nationalities, economic classes, ages, genders, sexualities, geographies, political beliefs, professional sectors, levels of education, and walks of life.